Word to the wise: don't shoot yourself in the neck with a rubber band, especially not at close range. It hurts and kinda feels like I'm going to have a gigantic hickey-neck-bruise. Nice way to kick off a new week. You know, just in case you ever thought about shooting yourself in the neck with a rubber band. Onto other (probably more interesting) matters: We're getting a hand me down couch soon. It's going into the fishing lodge to replace the black couch. The black couch will go back into the living room for less actual living on. Something about a kid crazy for pens + a nice couch makes me nervous. So this is the couch. My sister kindly sent me pics of it and I pieced them together. It has a few issues that come from everyday use, but it's a good couch and has a sofa bed. I'm thinking the sofa bed aspect will be vital for older Mabel when she has slumber parties. Of course, a new piece of furniture can't possibly enter our house without a requisite time sucking project involved, right? So I've been daydreaming of ways to make it fit into our house. A little bit of vintage fabric, maybe making single, long bench type seat cushion. I could even change up the legs if I wanted. All the possibilities. 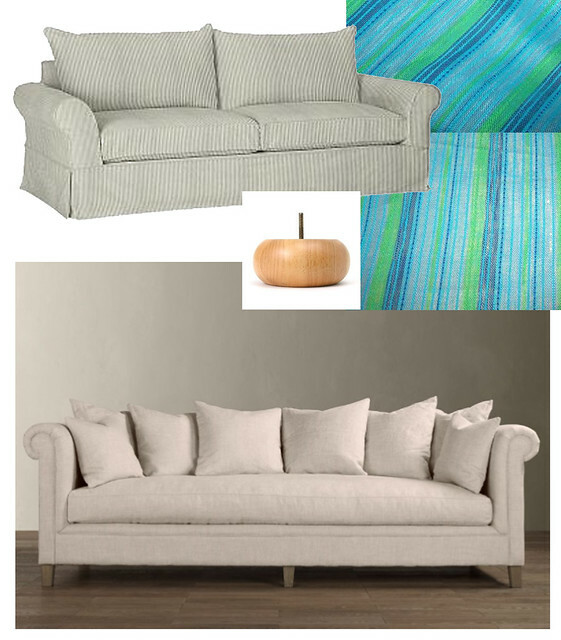 . .
Credit where credit is due: Blue and white ticking love seat; ebay vintage fabric (I searched for 13 yards or more); legdaddy bun sofa legs like what are currently on the couch; Restoration Hardware Carlyle Sofa. Tomorrow: 2 new beds. . . garden beds, that is.